Just purchased this cycle shed to store my racer in over the bad weather (yes, I am a fair weather cyclist). Went together well and has a nice design - looks good. Strong build and hopefully safe storage. Can't complain, cheers. Over all I am quite impressed with the finished product! Time will tell over durability but I suspect it will last a really long time. I like the concertina design of the roof and front door, easy to use and access. Assembly took about three hours with two helping. Overall very pleased – good. Good quality and simple to assemble correctly. Inside kept dry despite recent heavy rain and wind. So safe and secure. Purchased this product a couple of weeks ago and assembled it last weekend. No problems with construction (took about 4 hours) and have bolted it down onto an existing concrete base. Looks good and quality seems good also. Well designed and easy to use - I would recommend. 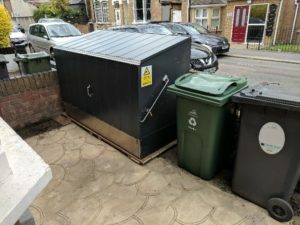 Cycle storage in London is a problem. This is a ideal solution for me. Dad helped put it together over the weekend and took about three hours with tea breaks. Use it everyday. Good design and security - perfect for my road racer and trusty shopping bike. Easy to use. No problems whatsoever. Simple to assemble, is the third one I've bought and they last forever. Lived up to my expectations. Excellent product. I would recommend it to anybody. Fairly easy to put together. Strong and secure once completed. The bike store has weathered well since fitting some nearly 2 years ago. It remains a sturdy, easy to use and well constructed bike store. Sturdy and well engineered but fiddly to put together with some bits not properly explained/diagrammed. Looks good and does the job although only 2 full sized road bikes fit comfortably. A good and functional product, which has served well. Space saving. Downsides? Not perfectly aligned and you need to learn certain knack to open and close. Comfortably houses 2 bikes, 3 a struggle. Complex to assemble - we found and paid a flat-pack assembly firm. Overall we are pretty happy with this product though. Quite easy to assemble, good quality shed, will last for years. excellent product, well finished, with easily assembled. with explicit Instructions. Very pleased with the product. Originally thought expensive but well with the money. Took 2 people 4 hours to construct but due to fixings bring on the inside making it secure. Lid stays up and bikes always dry - definitely recommend! A good sturdy product with a long life. Still in very good condition, keeps the rain out. A good sturdy product with a long life. Good product very secure. Bit tricky to assemble. whether for bicycles or other valuable pieces, look no further than one of these stores. The only criticism I would have is that sliding the top unit onto the base can be frought with difficulty. The aluminium parts are prone to galling and if you are not prompt with the sliding motion or you get out of line you may come too close to disaster. The instructions do give some warning of this possibility but I would suggest researching alternative materials - choose dissimilar metals not prone to corrosion that will make galling unlikely. Other than that the assembly is straight-forward, if time-consuming. If you are looking for a secure store - whether for bicycles or other valuable pieces, look no further than one of these stores. It looks good and ably protects our expensive cycles from theft and weather. We are annoyed by two niggles which are that the bolts should be galvanised to resist the effect of the damp British climate. The bolts and the plates underneath are already showing signs of corrosion. Also, the left-hand hasp will not stay in the up position when trying to open the lid making it difficult to hold in position whilst opening-up the top..
Great product. Quite fiddly and time consuming to construct but low-difficulty and once built it's pretty perfect. Strong and substantial. Reasonably easy to build. the box I bought, came in flat pack format, was easy to build by following the great step by step instructions. I have lots of confidence that the stuff in the box is very secure. Extremely good quality well-made item. Extremely good quality well-made item. Took two of us about 5 hours to construct as it is very heavy as you would expect. So far has kept our bikes dry after heavy downpours. Easy to open and close - good heavy duty locks. Only thing is I am struggling to see how it will fit 3 adult bikes as I can't even get 2 adult bikes and a teen bike in there no matter which way I configure them. Would have given 5 stars otherwise. Overall am very pleased as it has got the bike out of the house and stored away securely which was the purpose of buying. Fits 3 adult bikes, just! Delivery took a bit longer than advertised due to a stock take which meant that timings for receipt of the bike store became a bit difficult. It was fairly straight forward for an experienced handy man to put together and is working very well. It fits one men's and 2 ladies bikes ....just! We had to take a picture to remind ourselves how to get the bikes back in after we got them to fit the first time as it is quite an art to get the 3 adult bikes in. "Best available for the money - SUPERB PRODUCT"
"The Bicycle Store is robust enough to deter anyone breaking in and is a sound investment. - HIGHLY RECOMMENDED"
"Top marks for design and ease of use and we recommend that readers put one on the top of their wish list."